There’s a little time to mention this weekend’s Whispers & Hurricane’s neo-folk/experimental pop gig in north London. Straight cut’n’paste from Chaos Theory below, plus the usual clips and videos. “This edition of Whispers & Hurricanes is a very special one indeed, as T.E. 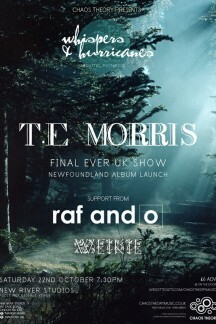 Morris joins us at for his last ever UK solo show, and simultaneously/belatedly launches his fourth and final full-length solo album ‘Newfoundland’. As the multi-instrumentalist, vocalist and songwriter behind critically acclaimed cult post-rock band Her Name Is Calla (with a career spanning well over a decade, extensive tours across Europe alongside such renowned acts as R.M. Hubbert and Willy Mason) he has more than twenty releases to his name, including soundtracks for film and novel, and television credits with Warp Films. Following ‘Newfoundland’ (out via Robot Needs Home Recordings) he’ll be turning his focus to new creative endeavours and future commitments with Her Name Is Calla. “‘Newfoundland’ is a truly fitting release to mark this momentous juncture in T.E. Morris’ musical journey. Recorded at home in Leeds, and in Brno in the Czech Republic, Tom has enlisted the talents of several world class musicians to record this astoundingly beautiful album. A poignant, elegant, yet dark composer, it will be an honour to finally work with T.E. Morris and have him join us to celebrate his ultimate work. “Raf & O, a duo from south east London, have created a buzz with exciting performances of their unique detailed avant-pop, fusing electro/acoustic drums, vocals, synths and acoustic FX guitar. We’ve previously heard them perform music from their second album ‘Time Machine’ (which was in FACT Magazine’s top 10 albums of 2014), but now Raf & O are back after the release of split EP ‘Sonnet 62/ Ink’ with Grace Jones collaborator Robert Logan, and their third album ‘Portal’. “Receiving wide critical acclaim (including praise by David Bowieʼs pianist Mike Garson for their unique interpretation of Bowie’s song Lady Grinning Soul and having performed at some grandiose venues including the Queen Elizabeth Hall, this is a chance to catch the duo in a more intimate setting. “A colleague of T.E. Morris’ in Her Name Is Calla, Adam Weikert (a.k.a.Weikie) also performs powerful solo acoustic music, laden with foot stomping and heart tugging originals. Switching back and forth between banjo, piano and guitar the pace never slows, as he performs a comprehensive overview of the many facets of folk and its modern connotations. His poetry is steeped in Americana, but with an ear for modern songwriting and production techniques.